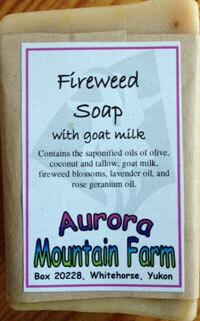 Making your own soap is fun and, with the right equipment, is quite easy. You'll need a good quality thermometer, rubber gloves, a stainless steel pot, plastic stirring utensils, and something to mold the soap in. 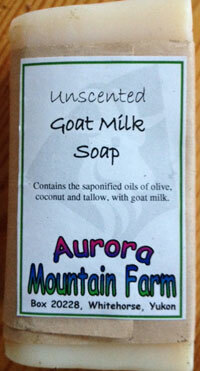 In no time, you'll be producing gorgeous bars of mild, sudsy soap. Gift friends and relatives with your creations -they'll love it too! 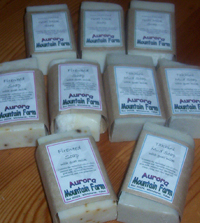 Cold process soap such as this lathers well, smells good and is good for your skin since all the glycerin produced during the reaction stays in the soap. And it can be truly a local, sustainable product when you use tallow from locally-raised, grass-fed animals. Pay attention to the details! Although there is quite a bit of "flex" in a soup recipe - there isn't when making soap. Be sure the measurements are exact and the temperatures precise. There is room to play when it comes to adding scent or botanicals! And you can dress up the finished bars with ribbons and lace or anything else that catches your fancy. Caution! - lye is caustic and will burn if it comes in contact with skin or eyes. Wear rubber gloves and glasses when making soap. Prepare the lye solution outside. Measure 700 mL of cold, distilled water into a 2-L jug. (Use something that can resist temperature changes - Pyrex is best.) Put your rubber gloves on, take the jug outside, and stir continuously while slowly adding the contents of a 269-g container of lye crystals (sodium hydroxide). Be careful not to inhale the fumes - it's why you're outside... Stir until completely dissolved and leave it outside to cool to 37°C. Melt two 454-g blocks of vegetable shortening (or other solid fat such as tallow), 750 mL of olive oil, and 250 mL of coconut oil in a large stainless steel pot. You want the temperature of this solution to be 37°C as well. When both solutions are at 37°C, slowly pour the lye solution into the warm oils; stirring constantly. Keep stirring until the fats begin to saponify. (It should take between 20 and 60 minutes.) You can alternate using a hand blender with brisk hand stirring. When tracing occurs (dribbles from the stirring spoon leave dents or tracks on the surface before they slowly sink), you can add scents, spices, botanicals, colours, etc. Add lots of scent since the chemical reaction will continue to work and will use up some of the essential oils. For a batch this size, 5 mL of essential oil will result in a mildly scented soap. Carefully pour the soap into the prepared mold. Cover the surface of the soap with the lid (or plastic wrap) and then wrap it in a blanket to let the soap set. In 24 to 48 hours, remove the soap and cut it into bars. Arrange the bars on a rack so there is room for air to move around them and let them cure for at least three weeks before using or packaging. The longer you leave the soap exposed to the air, the harder it will become and the longer it will last. 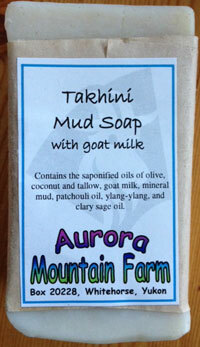 We make and sell three types of soap - Unscented, Fireweed, and Takhini Mud. All use extra virgin olive oil and replace some of the water used to dissolve the lye with goat milk for extra nourishment. Visit the Potluck Coop, Yukon Made Store, or the summer market to smell some today.